Tag Archive | "EU migrant crisis"
The Migrant Crisis: A Test of European Coherence? Europe is facing one of its largest refugee crisis since the end of the Second Word War. Violent conflicts in the Middle East (mostly from Syria, Iraq, Afghanistan) and in Sub-Saharan Africa (mostly from Eritrea, Somalia) have generated the flight of thousands of men, women and children from war zones, persecutions and/or extreme poverty. The impact of these conflicts is ever increasing on the civilian’s side hence, the large number of displaced (forced or voluntary) civilians into foreign countries. The wealth of Europe where most members have ratified the 1951 Refugee Convention have made it an attractive choice for these persons looking for a safe place to stay. Whether legal or illegal, for economic or humanitarian reasons, migration towards the EU is nothing new, however the numbers of migrants reaching the EU or dying trying is now too high not to make the news. The right of free movement of the persons within the Schengen is a sacrosanct element of the European Union and raise the crisis to a supranational level. However, as the crisis escalated, the EU has lacked of steadfastness in comparison with its individual members which in turn led to important disparities in the way the crisis is handled. Italy was the first member of the EU to respond to the humanitarian crisis of migrants with the Operation Mare Nostrum in 2013. Italy carried out its own rescue and search missions from its borders all the way to the coast of Libya. The operation was unfortunately discontinued after the Italian request for additional funds to other EU Member States remained unsuccessful. Operation Mare Nostrum was then replaced by the EU Frontex mission which contrary to its predecessor only aims at securing the European borders. In 2015 alone, more than 300, 000 persons in distress illegally reached Europe via the Mediterranean Sea in hope of safer and better lives. Up north, the Western Balkans route (via Turkey; Greece then Macedonia, Serbia, Hungary, Slovenia, etc…) is also one the busiest routes to the EU. More importantly, many refugees and economic migrants call upon the services of unscrupulous smugglers who charge them thousands of dollars for a life-threatening trip to their final destination by sea and/or land. They embark on a very long and very dangerous journey to reach Europe by sea and land, risking everything they have: their lives and that of their families coming along. In August 2015, Austrian authorities made the macabre discovery on a highway of 71 dead corpses of migrants (assumed to be from sub-Saharan Africa) locked in an abandoned truck. Before that, in 2013, a boat carrying more or less than 500 African migrants sank by the coast of Italy by Lampedusa. An outraging number of 360 persons died and 155 were rescued by the Italian navy. At the time of writing of this article, the humanitarian crisis is intensifying, the UNCHR has called on governments to strengthen rescue operations, provide swift access to asylum procedures for those in need of protection, and offer legal alternatives to dangerous sea crossings. The UN Agency also estimated that 3,500 persons died in 2014 as a result of the crisis. As it has been demonstrated with Operation Mare Nostrum, leaving one country to deal with the influx of migrants in the hope that it will fade away is a mistake (Italy and now Hungary). By law, every non-EU country person must register in the first European country they set foot in to initiate the appropriate immigration status procedure, may it be that of an asylum seeker or of an economic migrant. Hence, the clogging of small countries of entry to the EU such as Slovenia (2 million inhabitants) or Hungary (10 million inhabitants). Hungary, the first state in the Schengen zone for migrants traveling via the Western Balkans route, just built a fence on its border with Serbia (not in the Schengen zone) to prevent the arrival of migrants into Hungary and thereby the Schengen zone. Finally, the Hungarian government unilaterally decided in October 2015 to close its border with Croatia (a candidate to the Schengen area) to migrants albeit “just” being countries of transit for migrants who generally wish to settle further west in Germany or France. On the measure, the Hungarian government’s spokesman stated that “The Hungarian government has taken the steps […] to protect the internal European freedoms and the security of the citizens of Hungary and Europe”. More alarming, Austria which is a member of the Schengen has now moved to erect a physical border with another member of the Schengen zone: Slovenia. Certainly, it is for the purpose of deterring illegal entry into its territory but inherently it interferes with the EU principle of free movement in the Schengen area. The impossibility to reach Hungary will deviate migrants from Hungary to Slovenia and other neighboring states, the same goes with Austria and Slovenia. Changing the route will not solve the challenge that Europe is facing as a political and economic union. In April 2015, the European Parliament adopted a resolution to impose mandatory migrants’ quotas on its Members in order to distribute equally the responsibility inherent with the arrival of migrants. The European Commission stated itself that the migration crisis is not an Austrian crisis. This is not an Italian, French, German or a Greek or a Hungarian crisis. This is a European crisis and it requires a collective European response. France and Germany are in favor of the scheme while others oppose it vigorously. Several Balkans states have denoted their opposition to binding quotas, Slovakia is even considering challenging the decision before the Court of Justice of the European Union. In May 2015, the European Parliament announced the establishment of an emergency mechanism for relocating migrants, a resettlement scheme to take in migrants from countries outside the EU and more funds for securing borders. Finally, the Balkan summit of 25th October 2015 resulted in a 17-point plan agreement between Europe and the Balkans states. The plan includes a “deal” still under negotiation with Turkey to help with the flux of migrants in exchange of visa-free travel for Turkish citizens and financial support. The implementation of the plan will be monitored by the European Commission on a weekly basis notably regarding the management of borders and of the flow of migrant (exchange of information; coordination with Frontex etc…). Looking at the future, it is important to realize that this debate should also focus on “immigrants-to-be”: persons wishing to establish their residence in the EU for at least 12 months. The bottom line is that many economic migrants and asylum seekers, legal or illegal, are not simply in transit and actually intend to work, put their children to school and/or to stay in the host country for some time. Once they have reached Europe, they still have to fulfill the conditions for residence or work in the host country. The arrival of migrants coincides not only with important economic difficulties in the EU but also with the recent rise of far-right parties across the continent. As much as the Grexit drama was an important test for Europe as a financial union, the migrants’ crisis might as well be the test for the defined idea of a European solidarity, identity and union. By the end of July 2015, more than 124,000 refugees and migrants had arrived in Greece; an astonishing 750% increase in the amount of refugees and migrants from the same time the previous year. The vast majority of these refugees are those feeing conflict and human rights violations in Syria, Afghanistan, and Iraq in wake of the humanitarian crisis. For these refugees, the Greek financial crisis has been both a blessing and a curse. For many, travel into the Greek islands is attractive because of the country’s reputation for leniency in immigration laws and lack of resources to adequately control its borders and the flow of immigrants. However, once they’re in, many face the bleak reality of the struggling Greek economy. Though some view Greece as simply the entry point into Western Europe with plans to move north to more prosperous countries such as Germany, many flee to Greece with very little possessions and money and can’t afford to travel any further. It’s at this point that the realities of the Greek economy and the scope of the refugee crisis come into view: Greece simply cannot support and process the major influx of refugees while at the same time trying to recover its dismal economic state. 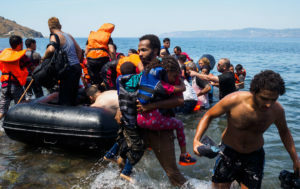 Frustrations in the wake of such considerations have reached a tipping point recently culminating in riots on the island of Lesbos over seemingly inefficient process for intake of refugees and inability of the government to provide basic necessities to those arriving on the islands. Although Greece is struggling to assist refugees, the generous response from the Greek society, in a very difficult time, should be and appears to be acknowledged with action and support from the European Union. On September 22, the EU Interior Ministers voted in favor of a quota system to address the crisis and help to relocate asylum-seeks throughout Europe. Though the plan has been approved by the EU Interior Ministers, it still must be considered by the EU Presidents and Prime Ministers, and the EU remains divided on how best to address the refugee crisis, with some member states calling the quota system “unreasonable” and a “waste of time.” However, scholars on the other side have taken the position that the massive influx of refugees seeking employment and ready to build a new life presents a valuable opportunity for countries like Germany, with an aging workforce and declining population, and have gone as far as to forecast that a sharp increase in growth will result for those willing to accept new migrants and asylum-seekers stating, “an influx of 1 million people over the next three years would raise the country’s GDP by 0.6% by 2020.” Germany’s ability to integrate a substantial number of asylum-seeks seems to have been taken into consideration, with Germany being asked to take by far the highest number of immigrants under the proposed plan. Demi Arenas is a 3L at the University of Denver Sturm College of Law and a Staff Editor on the Denver Journal or International Law and Policy.